I had flown to Hong Kong and taught a one-week course in information technology. Then I took a train to Guangzhou for a day. 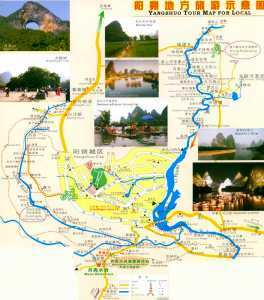 From there I would take an overnight train to Guilin, and then continue by minibus to Yangshuo, in Guangxi Province. That area of southeastern China has amazing scenery. The karst topography of the region has produced abrupt vertical pillars of limestone, the sort of thing I thought existed only in the artistic imagination of Chinese artists. Guangzhou West train station is huge — teeming masses of the proletariat outside, nearly teeming masses inside. Grime and no lighting inside, as expected. There was all the depressing would-be grandeur one could hope for in a train station built under communism. "In the past, I always thought that Chinese landscape paintings are the ideals of romanticism of the painters, after viewing the Guilin's landscapes, I have known that they are the portraits of the realism." — U.S. diplomat "Herry Kissenger", as he is alleged to have said on some Yangshuo tourism web page. Mangled language aside, I agree with this. Looking for the "departure lounge", I was ushered into the soft sleeper waiting room. It was a big room with extra-high-glare fluorescent lighting, avocado-green chairs and sofas with plastic slip covers, olive-green dirty carpeting, and a TV on a pedestal in the corner blaring western music videos. With my Russian backpack I was the grungiest person in the room, and apparently the only one that wasn't a party potentate of some sort. What an experience! After a while in plastic slip-covered bourgeois luxury, we were ushered to the train itself. I was in a top bunk of a 4-bed compartment. An affluent husband and wife who knew no words of either English or Russian occupied the two bottom bunks. Despite the claims in my (Soviet-era) Russian textbook, it seems that not all of the worldwide brotherhood of communists had learned Russian. We pulled out as darkness fell. After a while there was a tinny announcement, pretty obviously to the effect of "the dining car is open". The dining car was great — garish fluorescent lighting, crude wooden tables and seats, and empty beer cans rolling back and forth on the floor. The service was just as surly as one could hope for, although they managed to bring me food and drink based on my pointing. Fried rice with egg, celery, and peanuts, plus a can of Chinese beer, all for 25 RMB (US$ 3). The train's motion was jerky — the rails were at least as poorly aligned and joined as Russian ones. The train driving was noticeably worse than the Russian standard with very abrupt jerks toward and against the direction of travel. We looped north overnight from Guangzhou through Shaoguan and Chenzhou to Hengyang, Hunan, on the Beijing–Guangzhou Railway. 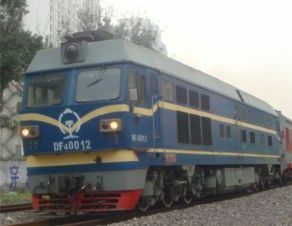 In Hengyang we turned back south on the Hunan–Guangxi Railway, passing through Yongzhou and reaching Guilin by early morning. I found the minibus to Yangshuo, a shared van like a Turkish dolmuş. You have to pay in advance, and foreigners have to pay more, even if they assail the driver in Soviet-style Russian for being Capitalist Tools suppressing the Working Class. I was stuck in a van with "John", an extremely high-pressure tout and entrepreneur. "His" hotel was the Happy Hotel, which combined high prices with an inconvenient location, all described repeatedly by an increasingly belligerent tout. I told him from the very beginning that I didn't want to stay at his hotel. His card described it as "Hotel, being quiet and tasteful environment, convenient communications, stands beside the Green Lotus Peak." 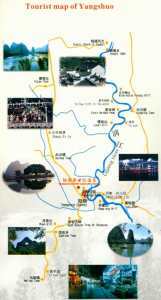 The reverse had a map showing its location between the Guoxing Telecom office and the electrical power substation. Granted, proximity to both a telephone switching facility and an electrical power substation would be useful for some things (for example, certain types of factories), but they don't seem that important for choosing a hotel. 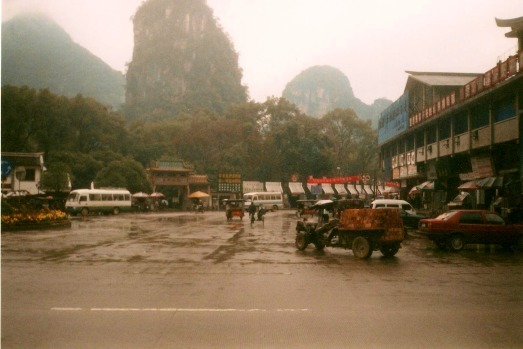 Coming into Yangshuo, but just at the very fringe of town, "John" got the driver to stop at the Happy Hotel. "John" announced, "This is my hotel, so we get out here." I wished him well and just sat there. He kept explaining that this was where "we" got out, and I kept telling him that I was riding the van to central Yangshuo. This caused no end of consternation and plenty of shouting back and forth between "John" and the driver. 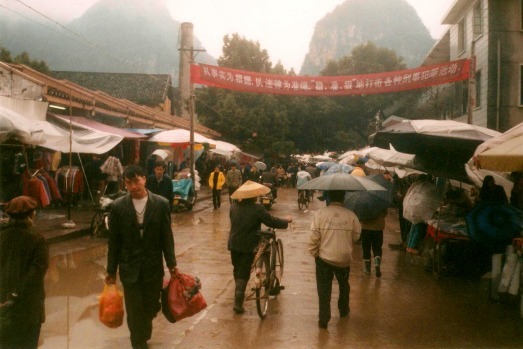 "John" reluctantly continued to the center of Yangshuo, telling me all the time that it was going to be a long walk through the rain back to his hotel. I told him that he had better get out quickly and start walking, or he would get soaked. Further consternation ensued. Finally the minibus reached the end of the line, stopping along the side of the highway running through the center of town. This was actually just across the highway from the bus station, which was a large gravel parking lot. By now "John" was openly furious that he was going to have to lead me all the way back out to the edge of town through the rain. But I got out, told him one more time that I wasn't going to stay in his hotel, and walked away. 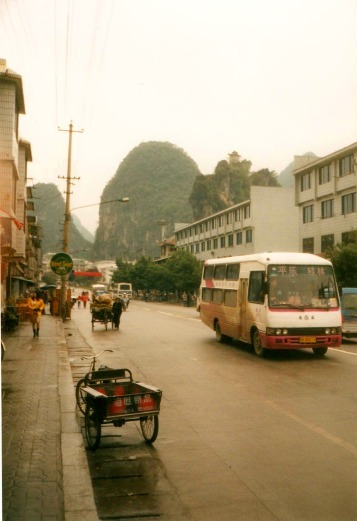 Typical traffic on the highway through Yangshuo. 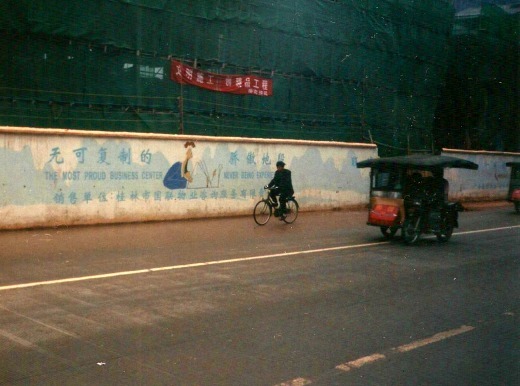 I walked up the main road, cut across, and headed down Xi Jie, the main thoroughfare. The angry screams of "John" faded in the distance. I was soon being chased by a small woman in a furry coat. 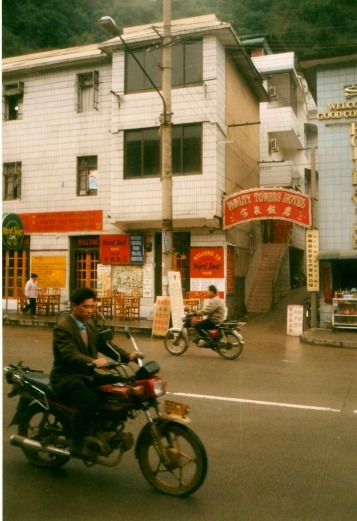 She said she was from the Fawlty Towers Hotel, which I had read about (32 Pantao Road opposite the bus station, Yangshuo, Guangxi, +86-773-8824309, -8827020). It didn't sound bad, why not take a look? It was back along the main road, very near where the minibus had stopped, set back off the road between two buildings. 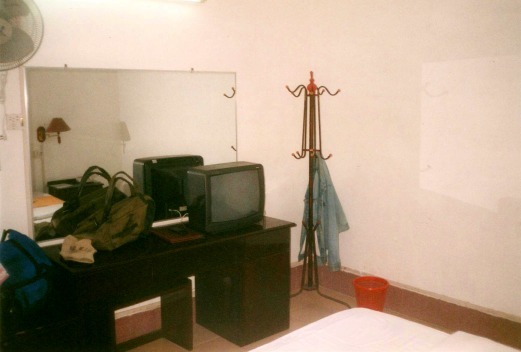 Actually it was pretty good — 40 RMB (US$ 4.85) for a room with a double bed, huge dresser, and TV, including my own toilet and shower. My private bathroom was strangely closed off from the rest of the room by an aluminum screen door. 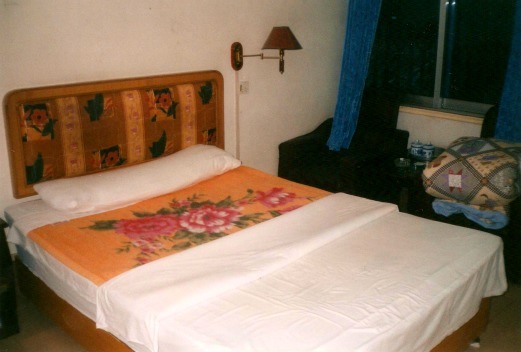 The room would cost 50 RMB (US$ 6.00) if I ran the heater, but the blankets looked thick and I had spent time in Russia. 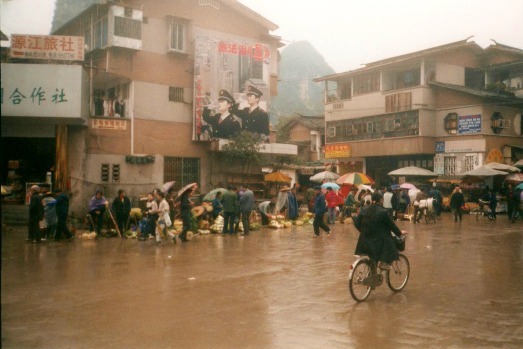 This was southern China, how cold would it get? As it turned out, pretty cold in December. But as Marx said, "From each according to his abilities." I later discovered that the "blanket" was really a combination of blanket, comforter, and sheets that weighed at least forty pounds. It felt like it would press you flat like those turtles in the Qingping Market, but it did keep you warm. That was good because by morning the room was cold and damp enough to see your breath. State television could keep me updated on the officially sanctioned views. The bed. About 10 pounds of blanket are in place. An additional 30 pounds waits in the nearby chair. I changed some US$ into RMB at the desk and recognized a guy from the minibus. It was Doug, a Vietnamese-American from San Francisco, who could usually pass as a local. He was going to talk to me on the minibus, but then saw that "John" the tout had latched onto me and so he stayed clear. He laughed and asked how I got rid of him. A few doors away from the hotel was a place that was steaming momo, or dumplings. It looked good, the steam was hot from vigorously boiling water directly underneath, and the people all looked healthy. I tried to make the point that I wanted "some" dumplings, but my 3 RMB got me an entire bamboo basket of a dozen dumplings plus a bowl of boiling hot ginger broth. I walked around town, it was market day. The market rotates between three towns, two days per town each week, one day off, so each town has a market every three or four days. The main items on display were mud, oranges, padlocks, cigarette lighters, socks, and mud. The scenery around town is just fantastic. 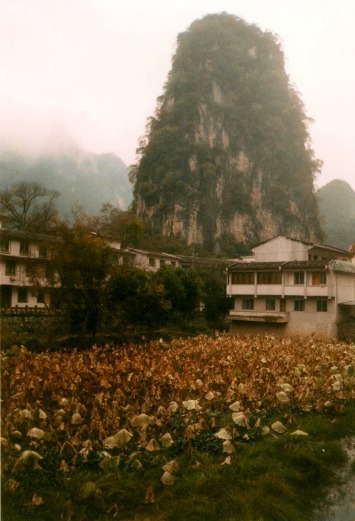 The scenery in central Yangshuo. Things are sold right off the street. Don't mind the mud and the water. 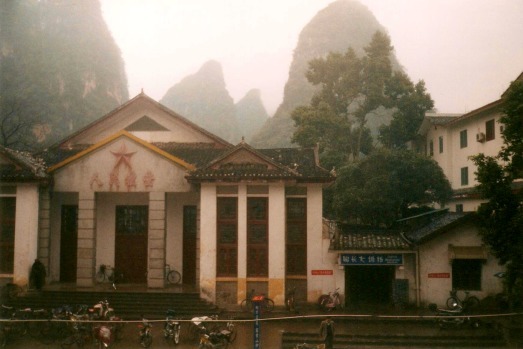 The town of Yangshuo was founded in 1408, during the Ming Dynastry. Todays its economy is based mostly on tourism. Umbrellas and conical straw hats for the rain. 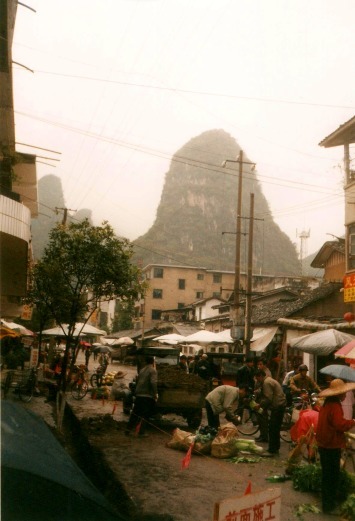 Mud and markets in central Yangshuo. After a while I returned to the hotel, then got lunch at the Hard Seat Cafe next door. It was trying to steal the thunder from the so-called Hard Rock Cafe down the street, thus copying the logo style from a place bootlegging the logo itself. A large plate of vegetable fried rice plus a large 640 ml bottle of Tsingtao for 15 RMB or less than US$ 2 total. The Hard Seat Cafe also offered an "American Breakfast": a slice of Spam, two fried eggs, toast with some unusually flavored jam, and jasmine tea. Napkins in mainland China consist of a roll of toilet paper on the table. But a swanky place can be spotted, as they place the TP roll in a plastic dispenser, most of them looking like a pink pig with an open mouth where the roll feeds out. 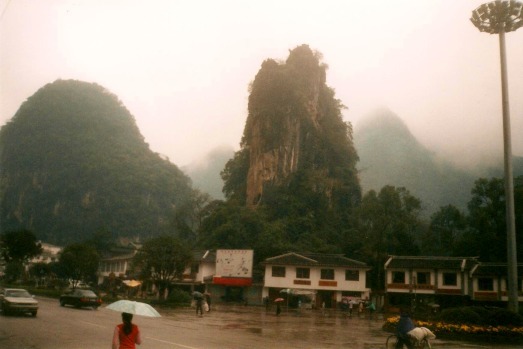 It was cold and damp in Yangshuo, one of these places where you're almost never completely warm and dry. Another thing you notice is the enthusiasm for SPAM . Spam for breakfast, Spam for lunch, Spam for dinner, they eat Spam all day long if they can afford it. Well, not corporate SPAM precisely, but some Chinese version of canned pork glistening with grease and saturated with salt, nitrates, and other chemicals. After lunch I walked around the markets some more and bought some cotton pajamas to function as thermal underlayer. Lots of leafy vegetables were laid in the mud along the street. I made a note to eat nothing that hadn't been very thoroughly cooked, and nothing terribly leafy or salad-like. That presents little to no problem, as salad-like food is mostly unavailable. Red stars and fantastic scenery. 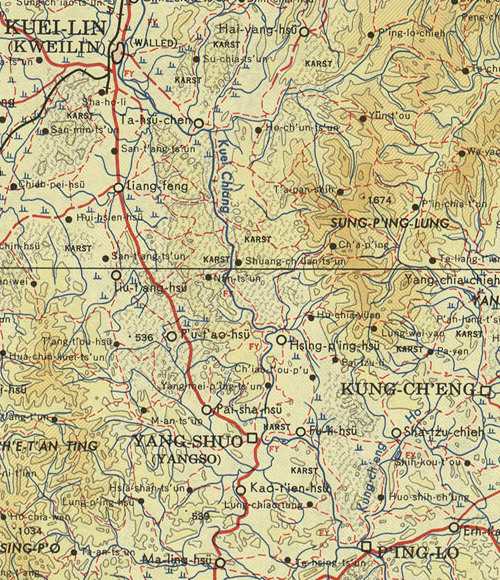 Map of Yangshuo district, full-sized version. here. 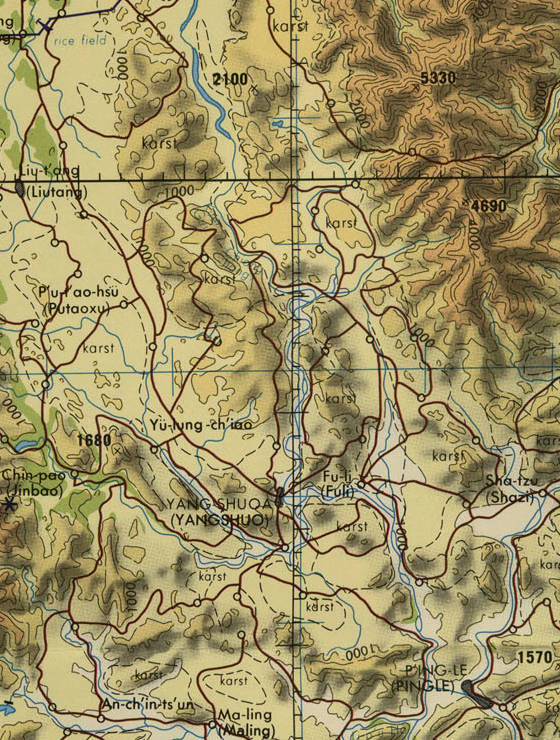 Map of Yangshuo, full-sized version here. The largest building in town was a three-level concrete structure at the center, taken over by the market. The ground floor was filled with food vendors, largely dealing in raw meat lying on wooden tables. The levels above were filled with clothing, far more clothing than there were people to buy it. Other than rampant capitalism, it's not clear just what the structure would be good for. It was built like a place where cattle might be housed on the third floor with broad ramps connecting the levels. All the floors and walls were concrete, so the whole place could be hosed out if needed. It was an oddly communist concrete grime-heap, exactly the style I had seen in the former USSR, especially in Tartu and Riga. The vegetable market and a dramatic peak. The Garden of Giant Fungus. The scenery right around town is fantastic — huge rock columns with vertical faces and roughly cylindrical cross-sections. I had always thought that the typical Chinese scroll paintings were highly stylized, but the scenery really looks just like that. The columns were all around and even within the town. Two or three within the town were 30 to 50 meters tall, those outside were maybe twice that. The movie The Painted Veil, based on the W. Somerset Maugham novel, was filmed in the area. It features the exotic terrain. At night the large hill directly above Xi Jie is floodlit by some eerie green lights. It makes a weird green glow on the hill and the fog and clouds above, a richly saturated green light that seemed somehow "extra Chinese" to me — the sort of lighting that you don't see elsewhere. Xi Jie and its array of shops and cafes. 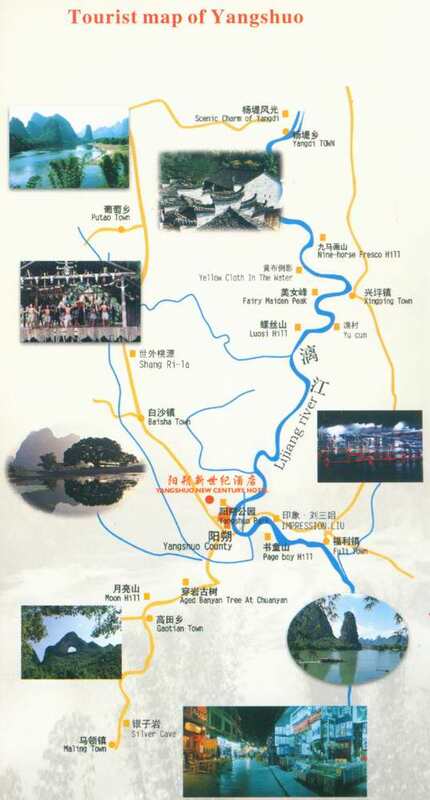 Xi Jie is the main tourist street. It has a lot of restaurants, bar, and coffeeshops, plus a variety of little shops. In the winter the businesses use wood stoves to keep the interior dry and fairly warm. In places serving food and drink, the waitress automatically brings around an iron brazier the size of a small bucket holding coals. It's placed under the table to keep you warm in what might be a fairly cold room. I was hanging out in one of these places warming up and having a Qin Dao, which might be Tsingtao spelled differently, or maybe it isn't. 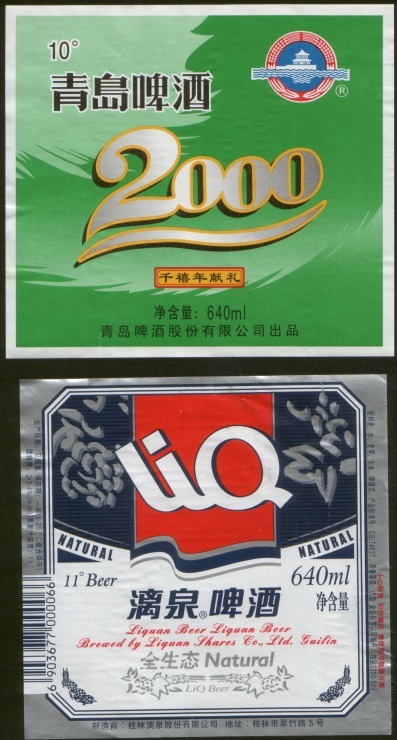 One of many surprising things about China is their enthusiasm for the elite import known as Pabst Blue Ribbon. That's right, there's a PBR brewery somewhere in China, and they see it as exotic and distinguished, not somewhat old-timey and low-budget but hiply ironic. Well, that's interesting, but really, let me try the local stuff. Their enthusiasm for PBR combined with their enthusiasm for Spam means you are offered some combination of Spam and PBR as gourmet dining at every meal. Did I ever have Spam and PBR for breakfast? No, that would be crass. I asked for the local beer instead. A group of Chinese girls at a nearby table soon asked me to take a picture of them with their camera. Then later, they asked again, but this time it was for me to be in the picture and for one of them to take it. Then they asked me to join them. There were four of them, just out of college, plus a matronly supervisor and a friend of the supervisor. The supervisor spoke pretty good English, the girls varied from fairly good to almost none, tending toward the almost none end of the scale. All of them worked at a "business hotel" in Nanning, in southern Guangxi province, and they had come to Yangshuo to practice their English. 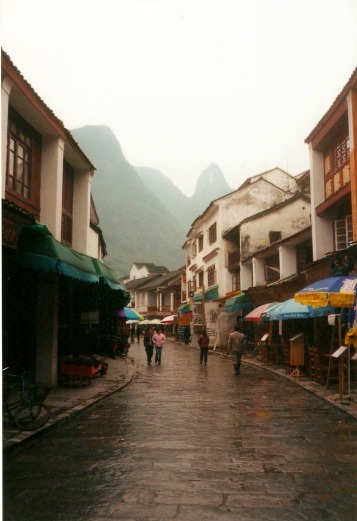 This was my introduction to Yangshuo's informal role as English instruction hotbed for the Chinese. 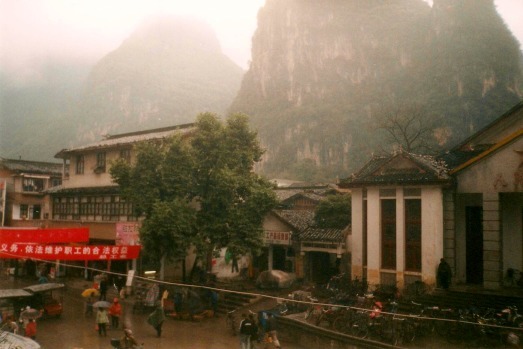 It seems to have become well-known among the Chinese that in Yangshuo they can find English-speaking independent travelers that they can use for practicing English. 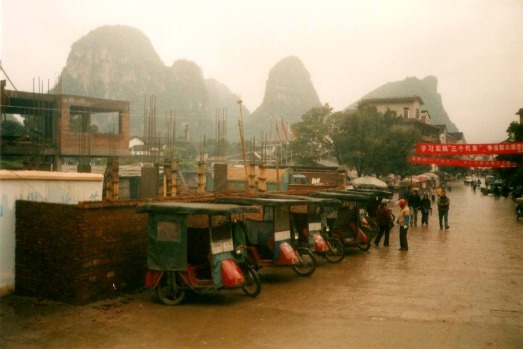 You can't sit very long in one place in Yangshuo during the day without being approached for English conversation. It's interesting at first, but it becomes tedious as it's always the same conversation over and over. "Do you find your hotel comfortable? What is your occupation? Are your country's national bus lines operated on a punctual schedule?" After a while they were all leaving to go get dinner somewhere, but I stayed behind as I was getting a bit worn out from trying to understand the broken English and to make myself understood. I went to the No Name Cafe and got dinner — "Yangshuo Style fried rice", with Spam bits, vegetables, egg, and peanuts. Yes, this is the original version of the "Young Chow Fried Rice" so common in Chinese restaurants overseas. I hung out there for the evening, had a few drinks and talked to some other travelers. Xi Jie is lined with cafes catering to foreign travelers. Yangshuo is like Göreme in Turkey and Dahab on the Sinai peninsula in Egypt: a standard stop in an exotic location, not visited by all that many people in absolute numbers but visited by all the budget travelers passing through the region. The cafes in Yangshuo fit this model by being reasonably clean (but not overly so), plenty of Yi Quao beer, and stereo systems. 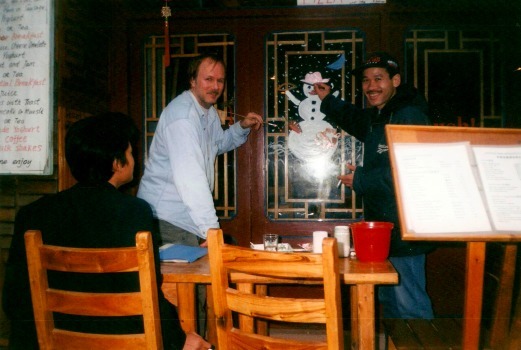 On another day, a cafe owner offered Doug and me a deal: If we eminent Westerners would paint some western style holiday decorations on their windows, she would give us drinks while we painted (not necessarily a step on the road to Good Art) and lunch afterward. That sounds good, let's get out the cafe's watercolor paints! Two heroic Workers, before allegations of subversion caused their oppression by running-dog lackeys of the Bourgeoise. The problem occurred after we had made a couple of snowmen. It was mid-December, so we continued with the standard iconography. It was our picture of three guys riding camels under a prominent star that freaked her out. "NO! NOTHING BUT FAT MAN! MUST BE NOTHING BUT FAT MAN! HOLIDAY IS NOTHING BUT FAT MAN!" Oh yeah, that's right, if the PSB was to spot something that vaguely suggested that religion might exist, the cafe owner might be sent off for a program of Self-Criticism and Re-Education. As the only available Westerners at the moment, we argued that there was more to the holiday than Fat Man. But to no avail. We were kicked off the job. Even after pointing out "You're kinda suppressing our working-class proletarianism here." Oh well, no free lunch, no big deal. Principles intact, we could leave her with a half-painted cafe window and buy our own lunch for next to nothing at some other nearby cafe. I changed some money at the Bank of China, an elaborate multi-sheet paperwork ritual. Carbon paper, rubber-stamping of three sheets with two different stamps, and lots of wasted effort. 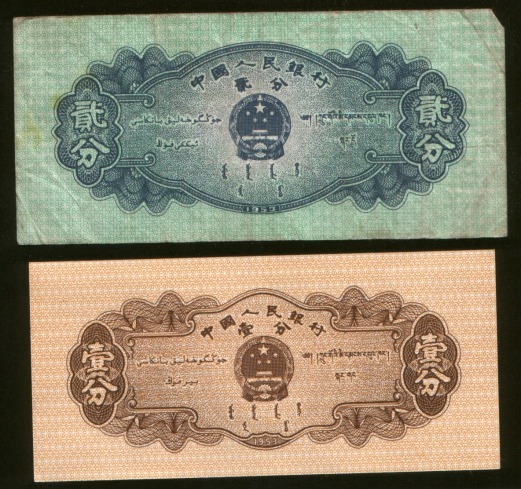 Each RMB/Yuan/kuái is divided into ten Jiao (sometimes called Mao), and each Jiao is further divided into ten Fen. The precision of the transaction meant that I received two two-Fen notes, worth US$ 0.00242 each. 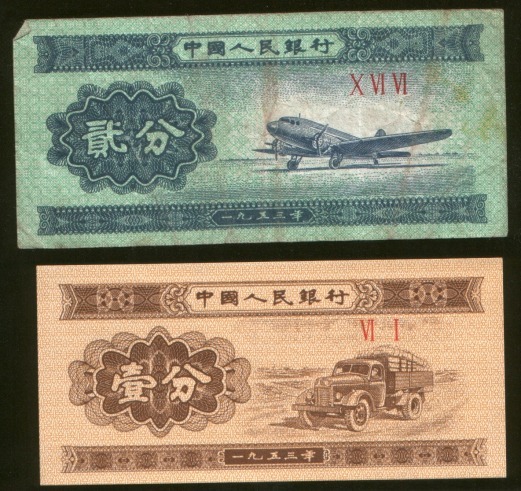 These were small notes showing a Chinese copy of a U.S. DC-3/C-47 on one side. I thought that these were interesting, so I returned to the window with a one-Jiao note (US$ 0.0121) and tried to signal that I wanted to exchange it for five of those two-Fen notes. Seeing that I was a true connoisseur of nearly worthless currency, the woman insisted on instead giving me ten one-Fen notes, worth US$ 0.00121 each. These were brand-new, uncirculated and nearly worthless notes, displaying a picture of a cargo truck. Very proletarian. Two-Fen (blue-green) and One-Fen (beige) notes. Next to the bank was a post office. Or at least I think it was a post office. It had a strange atmosphere, being laid out, furnished, and staffed more like a women's clothing store. But in addition to many irrelevant items you could buy postcards and Chinese stamps. They also had the U.S. Richard Nixon stamps. Nixon is still highly regarded in China. Too bad we can't still get Nixon stamps at the post office in the U.S. I would send all my mail with Nixon stamps. In 1972 Richard Nixon took the vital step of recognizing that China, an enormous and enormously important country, actually existed. 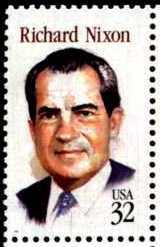 Richard M Nixon commemorative stamp. I would use these for everything. 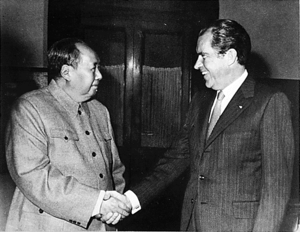 Richard Nixon with Mao Zedong in Beijing on 21 February 1972. Down by the Li River I watched some boats passing. There was a nice view over the river, across the open bottomland beyond, and to the limestone hills disappearing into the mist in the background. 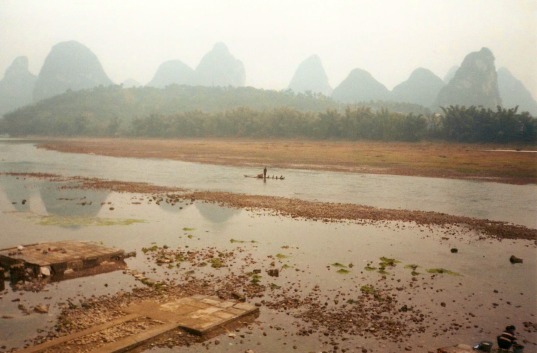 A cormorant fisherman on the Li River at Yangshuo. 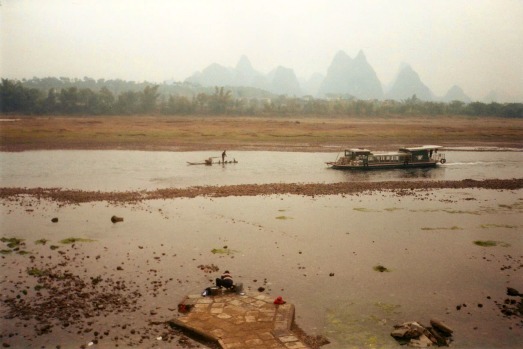 A cormorant fisherman and a local boat pass a woman washing laundry in the Li River. A couple of cormorant fishermen came downstream. They have one or two cormorants, with leashes attached to tight collars around their necks. The collars prevent the birds from swallowing the fish that they catch. The cormorant fishermen work during the day and at night, when their lanterns attract some types of fish. Two women had waded out into the shallow water from the town pier and were beating laundry against rocks. With the motorized boats in view, it looked like a scene from the early 1900s. Without them, it could have been about any time. A rickety truck-like vehicle goes to market. There was constant traffic along the highway through town. Some were through buses, most of them set up for overnight runs. The overnight buses had bunks, not seats, and were distinguished by their long windows along the bunks. There were trucks in varying states of disrepair. Lots of local traffic was right out of "The Road Warrior" — what appeared to have been trucks once, or partially assembled vehicles that never fully became trucks. The cab itself was only partially there, just the firewall and a panel behind the seat. No doors. Maybe a roof, or maybe not. The engine was usually exposed — no fenders, hood, or grille. There was only a minimal bed on the frame behind the cab. A row of motorcycle sidecar cabs await riders. The engines on these did a lot of whirring and sputtering, putting out lots of smoke. They seemed to run on oil only thinly diluted by gasoline, if at all, and looked like something out of a cartoon. There were also lots of three-wheeled motorcycles, where the passenger rode beside the driver and the whole thing was enclosed in a home-made box of plywood and plastic sheets. These provided the primary motor transportation for locals. The Most Proud Business Center Never Being Experienced. A Prospective Business Center Valued For Ever. First 30% Basking Fee Own You a Successful Business. The Valley of Tanned Guile Landscape Photographers. Sweets Golden Throat to Enter the Mouth and Become Effective.